Classic festival sand art activities for special events, birthday parties, parties, classrooms, homes, child care centers. Kids love to layer the sand colors to create a memorable artistic masterpiece. PET Plastic Sand Art Bottles. 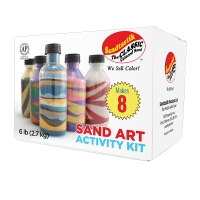 Sand Art Activity Kit Makes 8 Bring this classic festival sand art activity to your next party! Kids love to layer the sand colors to create a memorable artist masterpiece. 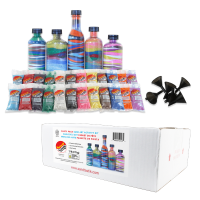 Pack includes 8 clear bottles with twist on/off lids, 2 sand funnels, and a rainbow of 10 sparkling sand colors. 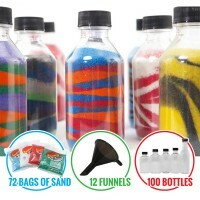 Layer on the fun at: Birthday parties Classrooms & child care centers Fundraisers Company..
Sandtastik® Party Pack - Sand Layering Activity Kit Makes 25 The classic festival sand art activity in a party-sized pack! Includes everything you need to design 25 memorable artistic keepsakes with a rainbow of 12 sand colors and small, clear bottles. Sandtastik® Party Pack Sand Layering Kit includes 12 sparkling sand colors, 25 clear PET plastic bottles with twis..